This pdf is 59 pages long, 1 page front cover, 1 page inside of front cover, 1 page credits, 1 page ToC, 1 page SRD and 1 page back cover. That leaves 53 pages of new arcane, not a bad bang-to-buck-ratio, so let’s dive in. The pdf starts with one page of in-character introduction to the book in the form of a letter as well as 3 pages of introduction that explain the new concepts introduced in this book. The explanation is an awesome read, using foot-notes and a nice pseudo-academic tone I always associate with mages. After that, we get 2 pages that explain the new concepts of segmented spells (spells that take up more than one spell-slot, but are more powerful), which is one of the most elegant solutions for e.g. cooperative ritualistic casting I’ve seen so far and quite frankly, I’m astonished why no one has had the idea to do so until now. There are also quick spells, spells that can either be cast fast or as a regular spell. We also get spells that refresh spell-slots for the casters. Another side-bar on the page has some optional rules to handle spells from non-core books like this – the ideas are nice and work fine: I’ll be using them for all 3pp products in the future! After that, we get 5 pages of spell-lists and after that, we get the 65 new spells. The description of the spells take up 24 pages and are quite interesting. Apart from one orison, none of the spells felt boring, unimaginative etc. – They are quite frankly almost all killer, no filler. I’m usually not a friend of spell-sourcebooks, but these spells, especially the segmented ones, fill a niche that has went unattended for too long. None of the spells felt too powerful or useless and none duplicate lame effects and have their niche. The first Appendix is 8 pages long and depicts a cool in-character description on how the book was compiled – being an enjoyable read, this section also doubles as a nice set of adventure hooks for further research of the spell-concepts packed into this book. Appendix 4 introduces 8 focused schools for wizard specialists. Appendix 5 features 8 new familiars, the animated object, the hedhehog, the newt, the poisonous frog, the rabbit, the skeleton, the turtle and the bonsai tree! Yep, the bonsai tree familiar. Awesome idea! The editing, layout and formatting are top-notch, I didn’t notice any typos or glitches. The book is full-color and parchment-style and features artwork that ranges from fair to beautiful. I haven’t seen the artwork before and really liked most of it. I did not expect much of this book, to be honest. I was expecting another moderately-inspired compilation of spells. What I got was something completely different: The writing, both fluff and crunch are inspired, segmented spells are an elegant, easy way to implement rituals, quickened spells are useful and I like the concept of spells that let you regenerate minor spell-slots. The appendices add to the overall appeal and feature some nice ideas. For 5 bucks you get an EXCELLENT book on the arcane that is truly “advanced”. The only true gripe I have with this book is, that there is no printer-friendly version included. Advanced Arcana I gets the Endzeitgeist-seal-of-approval nevertheless – I rate it 5 stars. Detract a star if you want a printer-friendly version. If you want some cool, fresh edges for your casters, check this out. 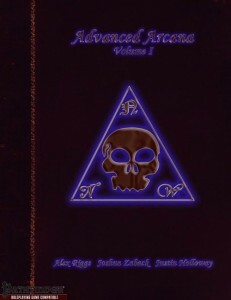 Check out Advanced Arcana Vol. I here!